I was listening to one of my favorite podcasts, Special Sauce with Ed Levine. The host was interviewing Frank Bruni. He used to be a New York Times Food Critic. He was talking about a cookbook he co-wrote with Jennifer Steinhauer, “A Meatloaf in Every Oven”. They were talking about their favorite meatloaf recipes. They spoke about their mom’s meatloaf recipe which got me thinking about my mom’s recipe. When I spoke with my mom during the week I told her about this interview and mentioned her meatloaf. I had a pretty good memory of what she put in her recipe. It was fun talking about it and that got us into other recipes too. She used to work second shift at Chrysler on the assembly line. Prior to leaving for work she always made sure we had a good meal for dinner, every single night. Meatloaf was easy for her to prepare before work. When I came home (or other siblings) we would put the dinner in the oven, set that table and have it ready for when Dad got home from work. We always had sat at the dinner table. I enjoyed the weekend when she wasn’t working so she was a part of our food and conversation. I am sure everyone remembers their mom’s recipe or has one of their own they love. I am going to share her recipe. If you would like to share your mom’s or your own recipe, please do. That’s it. She also mentioned to serve with ketchup. Oh, and it makes really good sandwiches if there is any left over. By the way, Frank Bruni’s was a Cheesy Chorizo Loaf. He made it sound so good I bought the cookbook. I guess we will be having some meatloaves in 2017. 1. Over medium heat add cumin seet, then potatoes. When potatoes turn brown, remove from pan. (Since cut small they should be done.) Set aside. 2. Wipe out pan with papertowel, add onion and brown. Add garlic. Mix until fragrant. 3. Add okra and cook on medium low for 6 minutes. 4. Add potatoes and powders, pinch of sugar, garam masala. Mix together. 5. Remove from heat, add cut up lime and garnish with cilantro. 1. Wash and clean taro, do not peel yet. Fill pot with water. You will boil until done. They are like a potato. Check for doneness with knife. When knife slides through easily they are done. 2. Remove from heat and run over with cold water, peel at this time. Cut into 1/4 inch slices. 3. Using non stick skillet, add 1 Tablespoon vegetable oil over medium heat. 4. Add taro slices. When brown on both sides put in powders above. Mix well. 5. Remove from heat. Garnish with corriander/cilantroEnjoy! 2. Add Butter and spices to small fry pan, medium heat. Stir for 1 minute and transfer to rice cooker insert. 3. Add rice and water to rice cooker per rice cooker instructions. 4. When the rice cooker is at the last few minutes (the rice cooker will let you know), add the peas to cook through the last few minutes. 5. Rice will be done when rice cooker turns off. Enjoy! wWe are celebrating Northern India for February. Saturday I visited the local Indian store to grab some ingredients. The menu that I chose was red lentil soup, chicken curry and for dessert carrot halwa. When I went up to the counter with a scant few ingredients, the owner asked me why I wanted the red lentils. I told her the menu I came up with. She said you don’t want lentil dal (not soup) and curry, they do not go together. I ended up spending 2 hours with her. She wrote out recipes explaining how to make chicken curry, okra/potato dry spice and taro. I didn’t even get her name. However, I know she was born in Punjab and grew up in Bombai. She told me that in De Pere the Indian community is mainly from southern India. The flavors in southern India are with more heat and coconut. Northern India are with some heat and water/milk. Then we went back to her writing out this menu to share with my family. She said next time I come back she will write up Tandoori. Also, I will get her name! Thank you owner of Astha Grocery and Gifts, De Pere WI. If you love Indian food give her a visit and make sure you have time to visit. Marinate chicken with salt and turmeric. 30 minutes. Tomatoes, you can cut into small pieces or put in food processor to puree. It is recommended to use the food processor. Cut out top stem part. No need to deseed the tomato. Cut into quarters and put in processor, puree. Bunch of cilantro, chop off ends. Cut in 1/2. Chop leaves and set aside. Chop leaves/part stem and set aside. In large pot over medium heat quickly brown both sides of chicken. You do not need to add oil at this time. Take out chicken and set aside. In the same pot over medium to medium low heat, put 3 tablespoons of vegetable oil and 2 tablespoons of butter (ghee is preferred but for my first recipe she said butter was acceptable. If I continue to make Indian dishes, ghee is a must purchase item). Add, cumin seed, ginger, garlic and green chili. When color changes, put in diced onion, wait until it turns brown. Add salt. Saute until the onions are browned, about 30-40 minutes. Add chicken, potato and 1/2 coriander/cilantro into pot. Cook until chicken falls off bone. 45-60 minutes. When done add salt to taste, pinch of brown sugar, garam masala, lime juice and cilantro for garnish. We all enjoyed the Curry. Next time I will play around with the dry spices. I think they could have been kicked up a notch. It was definitely simple and delicious. 2017 will be a year of trying different recipes from countries around the world. When I checked my son, Eric (who enjoys cooking also) which country and recipe we should start with his choice was Canada. Reason – Poutine. I started with Tourtiere. This is a traditional meat pie typically served around Christmas. I made this for our Saturday dinner. Kent and I enjoyed it. For our first Sunday in January, we had Poutine, Montreal Smoked Meat Sandwiches (used Pastrami that I picked up at Ski’s Meat Market) and Nanaimo Bars. Each originated from Quebec except the Nanaimo Bars. They originated from Nanaimo, British Columbia. In a large skillet add olive oil medium heat. Add chopped onions and saute until soft and golden. 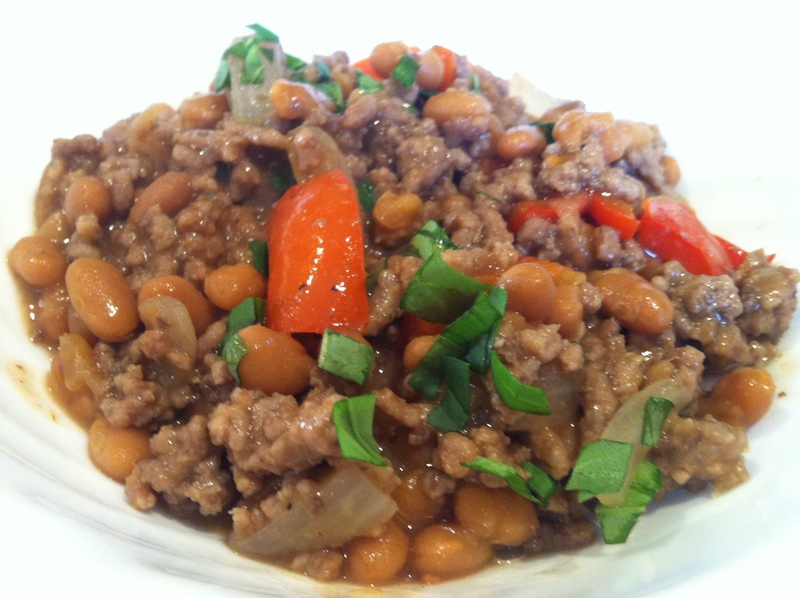 Mix ground meats together in a bowl. Add the ground meat to the onions and cook for about 10 minutes. Stir to break up the meat. Add remaining ingredients and mix together. Reduce heat to medium low and cover. Simmer for 20-30 minutes, stirring occasionally, until most of liquid is absorbed. Remove from heat. Taste the meat and add more salt, pepper or spices to your taste. Refrigerate 2 hours, until completely chilled. Spoon in the meat mixture (all of it, this will fit in the pie plate). Patting down lightly to compress it. Brush rim with water and place on top dough. Trim and flute. Brush egg wash on top dough. It is worth the time to do this. The egg wash gives you a nice golden crust. Cut some steam vents on top of your pie. Place in oven. Bake at 375 for 50-60 minutes or until the top of the crust is golden. Kent and I enjoyed this dish. It was great for leftovers too. Next – Pakistan. I would like to make foods from other cultures each month for 2017. I thought the last Sunday of the month was a good day for this. In January we chose Canada. The dessert chosen was Nanaimo Bars. This is a rich, layered bar. Simple and Delicious. 3. Press the mixture into a prepared pan. Bake for 10 minutes. Remove from oven and set aside to cool. 4. Make Filling; Using a medium sized mixing bowl, combine softened butter, 1 cup of sugar and vanilla. Beat until smooth. 5. In a small bowl, combine the vanilla pudding and milk. Mix together until thick and smooth. 6. Add the pudding mix to the butter/sugar mixture. Stir to combine. 9. Spread the frosting onto the bars. Refrigerate until set.